Need a BIG Tax Reduction? Go Solar! Here’s what you need to know about the 2019 solar tax credit. If you want to take advantage of the 30% Federal Solar Tax Credit, then you better start planning now. 2019 will be the last year the IRS will be offering a 30% solar tax credit and by 2022 you will have missed your opportunity altogether. The Federal government has rewarded its citizens for switching to solar power with the Federal Solar Tax Credit. It allows for a 30% of the costs of your solar power system to be deducted from your owed taxes. It is important to note that you must owe taxes to take advantage of this credit and it will not increase your refund. How Does the Solar Tax Credit Work in 2019? Like in previous years, the tax credit is 30% of your total installation cost of the solar panel system. The product, materials, permits, labor, and consultation fees are all included. So keep all your invoices and receipts for all purchases associated with the solar power and take 30% of that number. You will get a dollar for dollar tax reduction. So, if the solar system is $15,000 then 30% would be $4500. This would be a $4,500 tax reduction. Let’s assume you have you owe $6500 in taxes, you would deduct the $4500 and owe only $2000. Additionally, if you owed $3000 in taxes you would owe $0 taxes with no refund. How long does the Federal Solar Tax Credit Last? ? By 2022 the residential solar tax credit will be gone and down to 10% for commercial properties. However, the good news is that a system installed in 2019 will be able to claim the full 30%. But, the percentage drops to 26% in 2020 and 22% in 2021 for its last effective year for residential properties. Of course, as mentioned above, commercial properties will still be able to claim 10% in 2022. To ensure that you get the best ROI out of your solar investment is to make sure that you take advantage of this tax credit while it exists. Be aware some companies will allow you to lease the solar system. While cheaper for the near future, you will not be able to claim the tax credit. For this reason alone, you can see that it is more beneficial to own the equipment. Even if financing is used, the solar credit may still be used in the year of purchase. If you’re interested in reducing your carbon footprint while gaining a potentially sizeable tax credit, call Baker Roofing & Construction today. We will access your roof and let you know if it is a candidate for solar panels. We will provide you with a solar report and recommendations based on your needs and what the roof will allow. 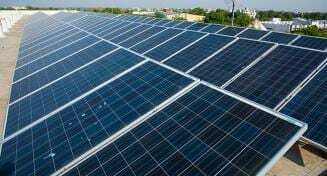 Contact us today to get your solar power system.